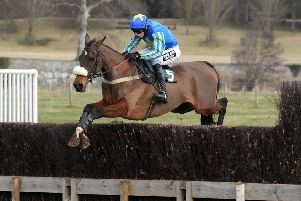 Jamie Hamilton, of Denholm, rides Tayzar to victory in the John Wade Chase at Kelso (picture by Alan Raeburn). Fergal O’Brien was rewarded with a short-priced double on Saturday at Kelso’s Remembrance Weekend race meeting. Aye Aye Charlie justified odds of 1-12 in the first race of the day, the George Harrow Memorial Novices Hurdle Race, before Troubled Soul followed up in the Best Jumps Racing On Racing UK Novices’ Handicap Chase. Both horses look set to have a promising future ahead of them. O’Brien said of Aye Aye Charlie: “He was looking about himself and he really just needed to get his head in front. Now he knows how to win, we’ll look for some bigger targets. The Challow Hurdle could be on the agenda”. There was win for local jockey Jamie Hamilton, who attended Denholm Primary School. He scored a popular victory aboard Tayzar for Ruth Jefferson in the John Wade Chase. Rose Dobbin, who trains just over the border in Northumberland, got on to the winners’ board courtesy of Jack Devine, who has enjoyed a profitable season already and appreciated the cut in the ground which was officially described as ‘good’. Charlie Mann sent Fixed Rate on the long journey from Lambourn and was rewarded with a win in the handicap chase, in the hands of jockey Harry Bannister. It’s a rare meeting at Kelso that passes without a win for either Lucinda Russell or Nicky Richards. Both were on the scoresheet on Saturday, the Russell-trained Alizee De Janeiro narrowly denying James Ewart’s Civil Unrest in the Mayfield Restaurant Handicap Chase. Nicky Richards won the Urwin Family Handicap Hurdle Race with Court Dreaming, in which the drama of the race occurred in the back straight. One Night In Milan fell, bringing down the Iain Jardine-trained King Leon. Jockey Finian O’Toole, who fell from One Night In Milan, was flown to Queen Elizabeth University Hospital in Glasgow, where he is being treated for a fractured pelvis. The final race of the day brought a first course win for Miss Tabitha Worsley on Time To Chill, in the William Hill National Hunt Flat Race. 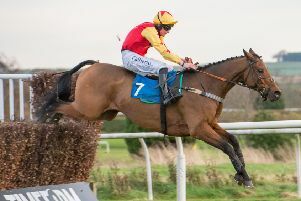 More than 3200 racegoers enjoyed the bumper eight-race programme, while the next Kelso fixture is the Persimmon Homes Scottish Borders National Day on Sunday, December 9.